If you have single glass panes as windows, make very sure that it is not in direct sunlight. If it is, the glass surface temperature raises up to 48 degrees celcius, quickly warming up the air inside your house. Whereas windows which are shaded from the outside, by louvre shutters or by overhang, are just of outside air temperature. 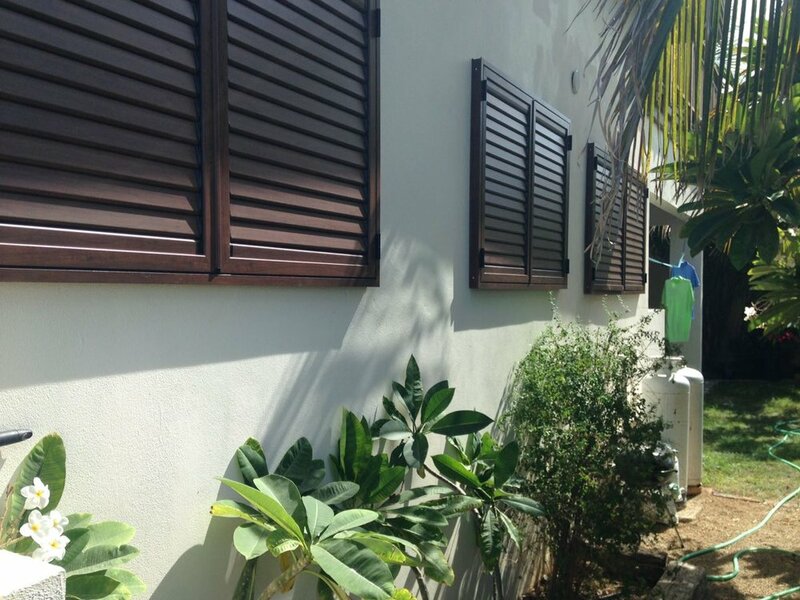 Traditional Caribbean louvres under a 15 degree angle work perfectly. Just look at the georgeous wood-finish aluminium shutters we made for one of our clients! As we all know, white surfaces are highly reflective and black surfaces are highly absorbent. That's why these iconic mediterranean villages have so many white painted buildings. Walls and roofs painted in light shades result in drastically lower surface temperatures. For instance, the temperature difference between a white wall and a light yellow wall in the direct sun is 14 degrees celcius! Even worse, the temperature difference between a white wall and a dark red wall in direct sunlight is 45 degrees celcius! Any color other than white contains pigment, so make sure to choose light shades of paint. Air that moves feels colder to the human skin than still standing air, even though the air's temperature is unaffected. By installing fans which circulate air in your home, you can create an easy comfort fix without using the airconditioning as much. 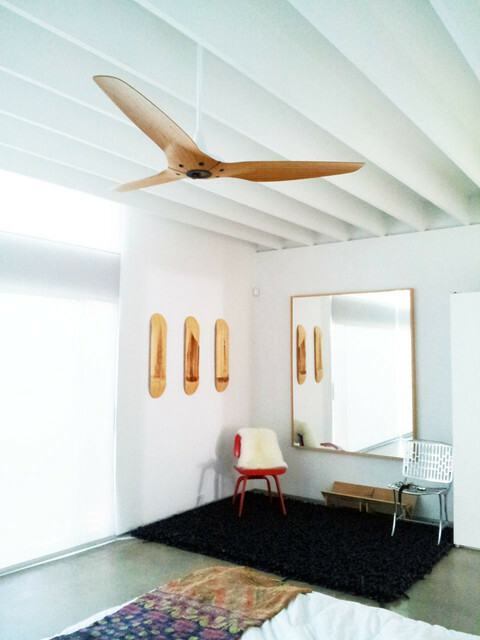 Ceiling fans come in many different designs, so we are sure there is a style which fits your interior well. If you sleep with A/C on, drive in the car with A/C on, work in the office with A/C on, just to get home to sit in the A/C, you are creating a habituation with which you can't comfortably live if the A/C doesn't work. Make it a habit to periodically live without airconditioning, and passively ventilate with the wind and ceiling fans more. The roof receives the most heat all day, so it is important to keep this heat out. By placing polystyrene panels on your roof, you can cheaply insulate your roof and live cooler. At night, turn the A/C off and open your windows. The trade winds slowly cool down the stored heat in the construction, because great mass (conrete walls etc.) warm up during the day and radiate the stored heat at night. It is important is to make sure that you install mosquito meshes and some kind of bars or louvres in your windows to prevent burglary. Old refridgerators, lights, and other equipment need a lot of power to work because they are energy-inefficient. It is interesting and may be mind-blowing to check your power consumption by looking up how much wattage your appliances have. Invest in new electronics with a good energy label, and replace all light sources with LED lighting. 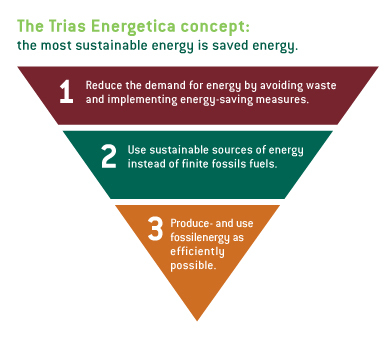 Newer PostHow to upgrade energy-saving solutions in the Caribbean?